The holiday season is filled with stories. Growing up catholic one of the first stories I heard was of the birth of Jesus. This story is much more than the birth of the Savior, it is a story of new beginnings and sacrifice. In our family, this baby represents goodness in mankind and the belief that we are all on earth for a bigger reason than ourselves. I do not mean this to be a post about Jesus, rather a post about stories and how powerful they are as we develop our own personalities and identities. For me, my story evolved to be the story of a Mom with three children, one with Down syndrome. This grew to be bigger than me and became a story of community, of advocating and of activism. The book is half written at this time and I have no idea how it will end, but I truly believe that if we follow our passions the ending will be good. This holiday season I have been following a lot of stories, some good and some not so good. I have read about other families impacted by disabilities, some good and some not so good. I have read of the joy of having a child with Down syndrome, I have learned of many families, just like ours who fight hard for their children and are making a difference. It is a season of thanks for the health of our children and the opportunities they will have as they grow older. But it is the other stories that have been so meaningful to me this season. The stories of people I had never met. 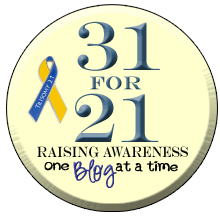 Truthfully, I do not know these people’s stories, I know they do not have children with Down syndrome, but I do know that their work is making a huge impact on the lives of families graced by Down syndrome across the world. At the TASH conference I had the honor of meeting two of these people, Bob Schoen, the Executive Director of Research Down Syndrome, and Amy Allison the Executive Director of the Down Syndrome Guild of Greater Kansas City. I have known both Bob and Amy through their work for a few years. Bob contacted me when I first started sharing our story in 2009. 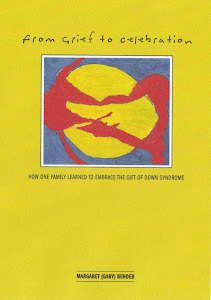 Bob was interested in learning more about families with Down syndrome as he began his journey of raising funds to support research aimed at improving the cognitive abilities of people with Down syndrome. He has been very successful in his work and to date raised millions of dollars to support research projects. I was honored we were able to share coffee while Alex and I were in Chicago. Amy I met through facebook , which is where I first learned about her work with families in the Kansas City area. Recently however, I have seen a number of posts about Just Like You – Down Syndrome a 14 minute film made in collaboration with the Down Syndrome Guild of Great Kansas City that explores the life, hopes, challenges and dreams of three kids living with Down syndrome. This film helps create an awareness and acceptance of Down syndrome and was the recipient of the Positive Images in the Media Award at the TASH Conference. Amy was at the Conference to receive the award as well as present the film the first evening. Alex and I were honored to introduce ourselves to Amy and put a face to all her work. As 2013 draws to a close, I take this opportunity to thank the hundreds of people we have met through Down syndrome. Most of these people I know through their stories or their work, many I have never met. But to Bob and Amy, I am so glad to have met you in person, thank you for all you do to make the world a better place for people with Down syndrome. What a beautiful video. Thanks so much for sharing and most of all thank you for sharing Alex and your family's story. I look forward to reading about all of Alex's trials and accomplishments. May she continue to grow into an independent, beautiful young woman who will always need her mother.